Røde has introduced what it claims is the world's smallest and lightest wireless microphone system. The Røde Wireless GO comprises of two miniature units - a receiver which fits onto the hotshoe of your camera, and a transmitter that has a built-in lavalier-type microphone. 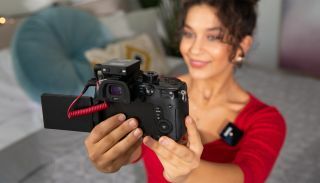 Both units have built-in clips that can be used to attach to clothing or to a gadget bag – and it is this clip that slides into the hotshoe or accessory shoe of your camera or rig. The receiver and transmitter weigh just 31g a piece, and measure around 44 x 46 x 18.5mm each. Both have their own inbuilt lithium polymer rechargeable batteries that promise an operating time of up to seven hours. Both also feature a 3.5mm jack socket, to connect the receiver to the audio input of your camera, and for adding an external tie-clip or lavalier mic to the transmitter. The units operate in license-free 2.4GHz radio range for easy of operation, and promise a usable operating distance of up to 70m apart. They come pre-paired - but it is possible to switch channels for manual pairing. There are three different gain settings to allow you to boost or reduce the volume of the audio input. The kit will be supplied with the transmitter, receiver, two stick-on fur windshields, a pouch, and cables. The Røde Wireless GO kit is set to cost £179 / $199 when it goes on sale from April 18.